Crazy day shooting yesterday. Wind was all kicked up and keeping everything down on the ground but the ash. We saw more eagles on the ground than I have ever seen. I watched one for over a half hour sway back and forth in some wicked gusts; I think it was sleeping, or trying to. It never did move so I moved on. The ash was getting kicked up too (Redoubt) and smelling acrid, but hey it’s all good. Snowed last night and that laid it down. Anyway got a few pics in, I liked these rail cars sitting out in the Valley. The railroad is doing some work out on the Knik River Bridge and these cars were sitting for the weekend. We got a light dusting during the night of the ash cloud that came from the late Saturday afternoon eruption but it turned out to not be too onerous. The snow was dirty but mostly just a trace. 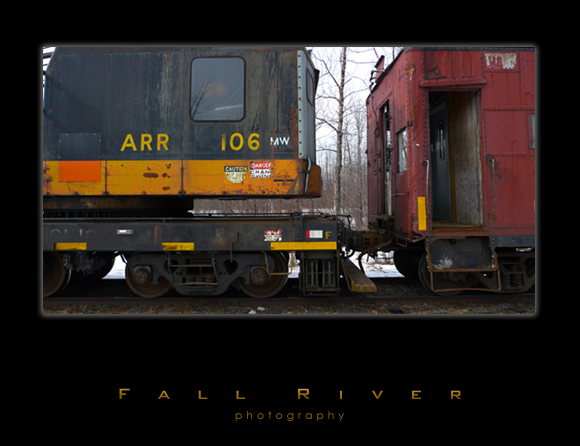 This entry was posted on Monday, March 30th, 2009 at 6:45 pm	and is filed under Landscape and tagged with Alaska, fall river photography, rail cars. You can follow any responses to this entry through the RSS 2.0 feed.